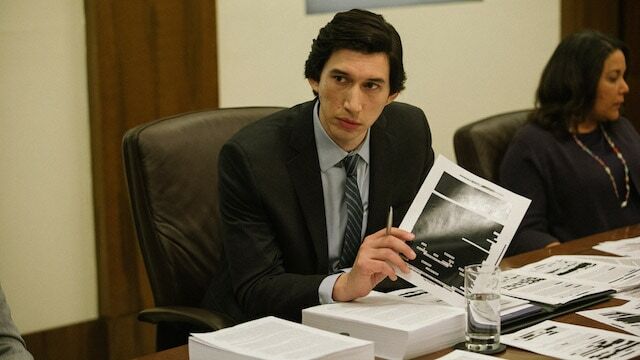 Adam Driver appears in The Report by Scott Z. Burns, an official selection of the Premieres program at the 2019 Sundance Film Festival. Courtesy of Sundance Institute | photo by Atsushi Nishijima. ‹We know that the bland, dark-suited people who run the government can sometimes be villains. But it’s easy to forget that people in government can also be heroic. Making stories about those people can be challenging as entertainment, but Scott Burns’ “The Report” manages to do just that, dramatize in deliberate, thoughtful chapters the investigation into America’s shameful descent into torture after 9/11. The film debuted on Saturday at the Sundance Film Festival. Senator Dianne Feinstein, played by Annette Bening, is the unlikely hero of this drama, as the veteran, centrist Democrat of California leads the Senate Intelligence Committee looking into allegations that the CIA tortured detainees. Her staffer Dan Jones, played by Adam Driver, is even more worthy of note. He spends fully six years digging into mountains of evidence, seeking the truth of what the CIA did, and why. After writing a 7,000 page report and a 400-page summary that the CIA heavily redacts, he fights to see the report released to the public. The film brings to life the antiseptic term “enhanced interrogation techniques,” colloquially known as torture, which we now know the Bush Administration made legal with a special memo after the 9/11 terrorist attack sent the country and government into panic mode. The threading of the legal needle is referred to frequently in the film as dependent on the result of the interrogation. If it works to get information that saves lives and if it does not confer “severe” and “permanent” physical damage, it is legal. “It’s only legal if it works” is repeated several times in the film. And the problem was… it didn’t work. The film depicts these acts: water-boarding, chaining detainees to the wall or the floor in “stress positions,” depriving them of sleep while blasting heavy metal music at impossible decibels. Even when the person on the receiving end is the 9/11 mastermind Khalid Sheikh Mohammed, it withers the soul. It turns out we, our democracy, did this for four years and all along failed to extract meaningful intelligence through this process. George W. Bush, the film narrates, was informed of the EIT practices in 2006. In seeking to understand how this all came to pass, Feinstein repeatedly confronts not only CIA director John Brennan, but Barack Obama’s chief of staff Denis McDonough (Jon Hamm). KSM was water-boarded 183 times, according to the movie. In a moment of devastating understatement, Feinstein asks Brennan why that would have been necessary if the procedure worked. The film is up for sale. Park City, Utah, is about to be flush with cash -- and we're not talking about buying apres ski gear. 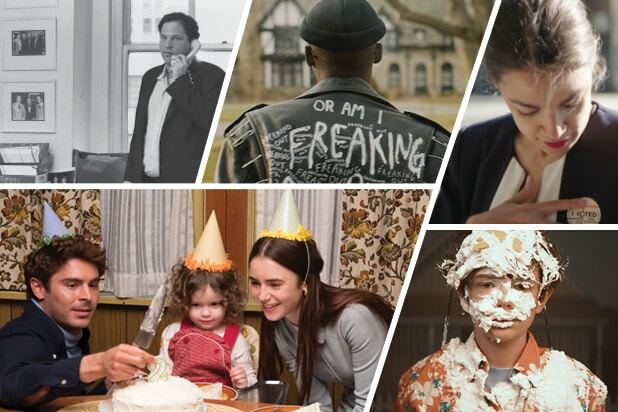 Here are the most buzzed-about titles of the 2019 Sundance Film Festival. (Note: some already have distributors). Filmmaker Bart Freundlich has enlisted esteemed actresses Julianne Moore and Michelle Williams to lead this adaptation of Danish director Susanne Bier's Oscar-winning film of the same name. After being invited to the wedding of Theresa’s (Moore) daughter, Isabel (Williams) discovers a connection to Theresa that takes her on an unexpected journey into her own past. Alfre Woodard stars as the warden of a maximum-security prison, who, after striking up a bond with an inmate, is confronted with the complex and often contradictory relationship between good intentions and unrequited desires. "Extremely Wicked, Shockingly Evil and Vile"
Almost two years in the making, Joe Berlinger's take on the notorious serial killer Ted Bundy is finally hitting the big screen. Zac Efron stars as Bundy, and the film will be told from the perspective of Bundy’s longtime girlfriend, Elizabeth, who went years denying the accusations against him, but ultimately turned him into the police. Lily Collins plays Elizabeth. The film also stars Jim Parsons, Haley Joel Osment and Kaya Scodelario. Shia LaBeouf wrote the screenplay for this film, based on his childhood and his relationship with his father. Directed by Alma Har'el, "Honey Boy" also stars Lucas Hedges, FKA Twigs and Noah Jupe. If you want to feel uncomfortable yet completely fascinated by a film, "Imaginary Order" is the one for you. It follows a suburban mom, played by Wendi McLendon-Covey, who makes mistake after mistake and her psyche crumbles in the aftermath. Documentaries continue to be huge, and this one details the struggles and meteoric rise of young Puerto Rican bartender Alexandria Ocasio-Cortez from the Bronx to toppling incumbents in an electric primary race for Congress. Described as gut-wrenching, this documentary uses interviews with the now-adult men and their families of those who have accused Michael Jackson of sexual abuse to craft a portrait of one of the world's most celebrated icons. HBO will release this doc in the spring. Renowned African-American history and culture visual artist Rashid Johnson and Pulitzer Prize-winning playwright Suzan-Lori Parks craft a contemporary reworking of Richard Wright’s 1940 novel, bringing its interrogation of fear, violence, race and circumstance into a critical modern context. A24 is the distributor. In 2018, Facebook came under fire many times for its use and misuse of users' personal data. That was never more apparent than the explosive Cambridge Analytica/Facebook data breach that this doc explores. Netflix will distribute this documentary. Hot off his awards run for "BlacKkKlansman," Adam Driver is back in "The Report" alongside Jon Hamm, Jennifer Morrison and Maura Tierney. The film, directed by Scott Z. Burns, follows CIA agents and their interrogation tactics in the quest to find those behind the 9/11 attacks. Harvey Weinstein, both in his rise and in his monstrous fall, changed Hollywood forever. "Untouchable" explores how he acquired and deployed his formidable power over the course of decades. "Nightcrawler" director Dan Gilroy reunited with Jake Gyllenhaal for the high-art thriller "Velvet Buzzsaw," which also stars Rene Russo, Toni Collette and Natalia Dyer. Netflix will distribute this movie. Awkwafina, one of the breakout stars of 2018, stars in this film about a family that opts not to tell their beloved matriarch about her lung cancer diagnosis, instead scheduling an impromptu wedding-reunion back in China. The film is based on director Lulu Wang's true story she told on NPR's popular podcast, "This American Life." This psychological drama stars Kelvin Harrison Jr., Octavia Spencer and Naomi Watts. It follows a couple that is forced to reevaluate the image of their adopted son after his high school teacher finds something alarming in his locker. Jillian Bell leads the cast of this comedy that follows a young New Yorker who discovers she has elevated blood pressure and a high heart rate. Soon, she starts running, and increases her distance by a mile a day. Buyers have expressed interest in this inspirational yet entertaining tale. Welcome to the New WrapPRO – We Love Our Members!